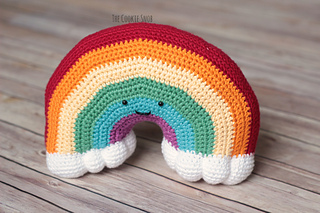 This pattern will show you how to make a huggable rainbow plushy. 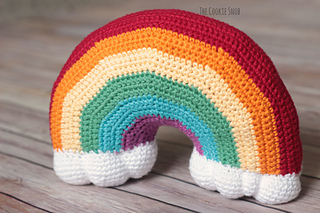 It’s made using a size E (3.5mm) crochet hook and less than 1 skein each of I Love This Cotton! 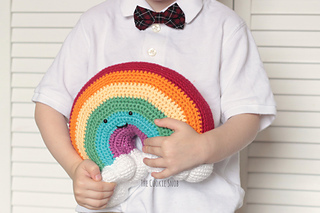 in White, Red, Glowing, Banana, Apple Green, Turquoise, and Hot Orchid. You’ll also need fiberfill stuffing and a tapestry needle. If you’d like to add a face, I’d recommend 6mm safety eyes and a tiny bit of black yarn for stitching the mouth. 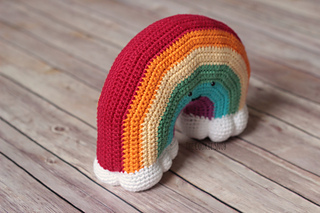 As written, the rainbow is about 10” x 6.5”, but can be adjusted to another size by following the basic increase/decrease pattern. If you’re a loose crocheter, I recommend you go down at least one hook size.